The opal focus stone on this solitaire comes in a 4mm round cabochon. Requests for all other gemstones are welcome- some previous requests are shown in the group shot! I fully create the ring band for each of these using traditional silversmithing techniques, then solder on the tiny brass bee stampings to flank the stones. 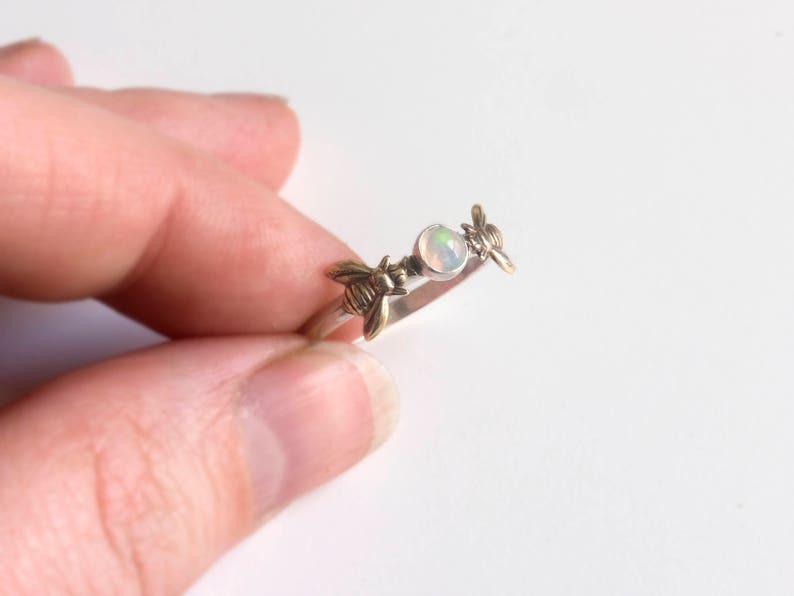 After I am pleased with the ring, I either bezel-set your choice of opal shape. With each one being fully hand-made from start to finish, they are not completely flawless and perfect, but rather each has character! Opals are very soft and fragile stones. These are natural Ethiopian opals, not lab created. Do not expose them to dishwater, pools, saltwater or any sort of trauma. This is not an every day ring and does require some care. Restore shine to the metal with a commercial silver polishing cloth (such as a sunshine cloth). Do not use a liquid cleaner as it will remove the oxidation from the little brass bees and harm the stone. Beautifully crafted! Great seller. Had a little mishap in entering my shipping address but it was shipped out again very promptly! Seller communication was swift and friendly. Item is freakin amazing and I love it! Couldn't have had a more positive experience. Thank you so much! absolutely love it! Also great communication with shop owner! The ring is absolutely beautiful and detailed, highly recommend the item and shop!